The target was to make an Android application to be able to make 3D photos with Goolge cardboard or similar virtual reality box. Make 3D photos with Google Cardboard or similar VR Box. 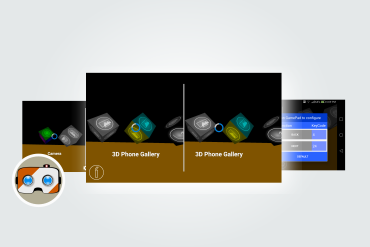 View 3D photos in gallery by Google Cardboard or similar VR Box. Make 3D photos for your 3D TV. The big advantage of this app is that you can see the 3D effect directly during making a picture. 1) You can review your 3D pictures in build-in gallery or share to your facebook, twitter, flickr. 2) Modify 3D pictures(adjust position, erase unwanted objects or blured parts, add 3D texts). 3) Adjust preview screen size to fit your Cardboard type to get best 3D effect. 4) Selection of color filters. 5) Decorate 3D pictures with 3D cartoons from built-in gallery.